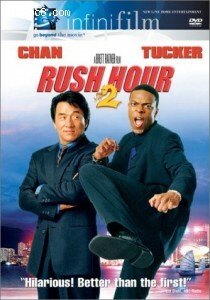 This page contains easter eggs for the disc Rush Hour 2 (DVD, Region 1). From the main menu choose select a scene. Select scene 7-8. Highlight the red dragon and you will see the second trailer for Lord of the Rings. Select scene 15-16, Higlight the 7 and you will see the last trailer for Lord of the Rings. 1 person has confirmed that this easter egg is valid, while no one has confirmed that this easter egg is invalid.